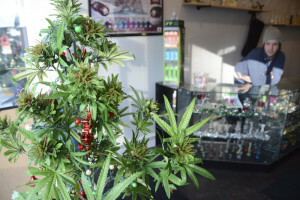 A marijuana "Christmas tree" sits in the window of Shire Glass, a fine tobacco shop on Main Street in Great Barrington, Mass, on Wednesday. On Thursday, a voter-approved measure legalized the possession of small amounts of recreational pot. A marijuana “Christmas tree” sits in the window of Shire Glass, a fine tobacco shop on Main Street in Great Barrington, Mass, on Wednesday. On Thursday, a voter-approved measure legalized the possession of small amoungs of recreational pot.